Where to buy them, what to buy, how to buy, quality and condition, and links to distributors and manufacturers of anvils. Latest update 02 November 2017. Updates coming. Major re-write in progress. I am actually going to replace the white and yellow picture place holder with a real picture one of these days. New anvils. New anvils can be bought from blacksmith and horseshoeing suppliers and importers. Scroll down this page to find links to distributors and manufacturers of new anvils. Purchasing used anvils. Things have changed a lot since I first published this anvil page. Craig's List and eBay have become the best resources for locating used anvils. Many of the old sources such as farm auctions, machine shop auctions, antique engine swap meets, etc., have become next to worthless for buying used anvils. On Craig's List and eBay the buyer will find photos of the items for sale - and this allows condition of the anvils to be very quickly determined without ever having to leave one's home. However just as most anvils sold at auctions were junk, so to most used anvils are likely to be in extremely poor condition and sometimes totally unusable. Remember - buyer beware and look closely at the photos. Beware of 'blacksmithing experts'. When I bought my first anvil 35 years ago, good used anvils were more plentiful and it was still possible to get a good deal on a used anvil if a smith had enough money. But even 35 years ago it was still very common for the new smith to get ripped off by dishonest 'experts' that the newbie thought could be trusted. I remember buying my first anvil from a backwoods flea market hillbilly, and that anvil turned out to be a worthless cast iron boat anchor. After spending more than a year trying to find a serviceable anvil at numerous farm sales and auctions, I concluded that it was faster and cheaper to just buy new and save the hassles and expensive travel and time attending distant sales events. With a simple telephone call and a letter to Centaur Forge, I had a new anvil for the same money I had already spent trying to find a used anvil. Never buy cast iron anvils! Buy only steel anvils or anvils with a steel face and wrought iron body - do NOT buy cast iron anvils. Steel anvils are a solid homogenous block of steel which reflect nearly all of the force of the hammer blows back into the work being forged. Wrought iron anvils with steel faces work as well as steel anvils. Quick test for determining if an anvil is cast iron or steel. The hammer bounce test is the easiest way determine if an anvil is cast iron or steel. Bouncing a hammer off the center of the face of the steel anvils, the hammer will bounce back up almost as high as it was dropped. Bouncing a hammer off the middle of a cast iron anvil, the hammer will bounce only about half as high. Steel anvils reflect hammer blows in a way that cast iron cannot. Why not cast iron? Cast iron contains layers or platelets of graphite throughout its mass. The graphite layers in cast iron anvils absorb concussion (hammer blows in our case) and cushion the work. This results in a softer work surface that absorbs the force of hammer blows- causing the blacksmith to work much harder to produce less product over the same time period compared with using a steel or wrought iron and steel anvil. Avoid cast iron anvils. Buy steel anvils. The hardie hole. The square hole in an anvil is called the 'hardie hole.' Hardies are specialized blacksmith tools with square shanks that fit in the square hole of the anvil. The size of the hardie refers to the square dimension of the tool shank that must fit in the square hole of the anvil. Measure your anvil's square hole before buying hardies. Standard hardie hole sizes only! Check with blacksmith suppliers to see what hardie sizes they have available before choosing an anvil. Professional smiths forge their own hardies, but the beginner will want to buy a cutting hardie when they begin blacksmithing. Look for an anvil with a standard size hardie hole. Anvils are available with a huge variety of hardie hole sizes. But few hardie shank sizes are available. Many cheap anvils have hardie holes too small for standard hardies. In many cases the manufacturer thought the square hole was some kind of decoration, Harbor Freight anvils are a good example of anvils that won't accept standard hardies, and another example is a seller on eBay that is currently selling cheap imported cast iron anvils (he claims they are steel) and the hardie hole is an is rotated diagonal and is of an oddball size of 5/8-inch. Oddball hardie shank sizes like 5/8" are not available. Common hardie shank sizes available at American (and British) blacksmith and horseshoeing suppliers. New hardies and hardie tools sold in the U.S. are most widely available in 25mm or 1 inch, and 1-1/4 inch sizes. The 25mm size fits many of the anvils imported from Europe. 1-inch equals roughly 25.5mm. A 1-inch hardie can be converted to a 25mm hardie hole by grinding the shank down slightly. Horseshoeing suppliers offer 3/4-inch and 7/8-inch cutting hardies for their smaller horseshoeing anvils- cutting hardies and horseshoeing related tooling only! Common hardie shank sizes available at European blacksmith suppliers. 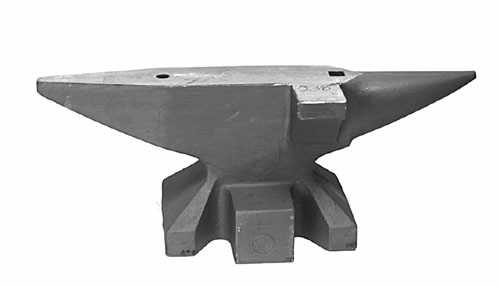 European anvils are available with a wide variety of hardie hole sizes including 25mm, 26mm, 28mm, 29mm, 31mm, 34mm. Smiths must forge all of their own tooling for the larger hardie shank sizes. Condition of the edges of anvils is important. 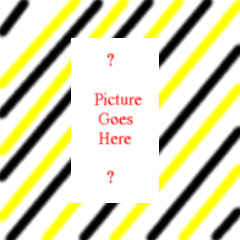 Look for good side-edges, - reject if badly broken up. Look for arc-welding on hardened surfaces, there must be no arc-welding on the face of the anvil because arc-welding destroys hardness in those areas, - reject if arc-welding is discovered anywhere on or near the hardened surfaces of the anvil. Look for a perfectly flat face (no warped or twisted surfaces). If the anvil has a warped or twisted surface then it is not possible to produce straight or flat surfaces on ironwork that may require straightening or flattening. Surface of anvil must be flat! The working surface or face of the anvil must be flat or the smith will have continuous trouble straightening ironwork. A warped surface causes the iron to assume a similar warped and twisted shape with every blow of the hammer. A flat work surface allows the smith to quickly finish the work flat and straight. This is an important rule! A flat anvil is a requirement. Good work cannot be done on a warped or dished anvil. Machining a worn out anvil face. If the anvil has a warped, dished, or twisted surface, this can be corrected by a machine shop that has the proper surface grinding machinery. Don't attempt this yourself with a hand grinder. A hand grinder will make the problem much worse. Machine shops use a special surface grinding machine that assures a perfectly smooth and flat finish. This is the same surface treatment used by anvil manufacturers to finish the faces of new anvils before they leave the factory. At left (click on photo to enlarge) is an example of an anvil that previously had a warped surface. After re-surfacing at a machine shop this anvil was as flat and smooth as the day its first owner took it home. Estimated cost in 2013 dollars to properly resurface a worn out anvil might be around $300US. Apply this cost to the overall price of a worn out used anvil. The bigger, the better. Buy the heaviest anvil you can find. Try to get a feel for how large an anvil you think you may need and then buy something larger. Most smiths end up needing a larger anvil than they first thought. Why the heaviest? Because a light anvil jumps and vibrates more under the blows of the hammer than a heavier anvil. Consider my 230 pound Kohlswa for an example. This anvil is a bit light for me as I can hit pretty hard. During recent filming of a forging demonstration in my shop the anvil can be seen shaking and vibrating violently under every hammer blow, and my anvil is strapped down to a heavy steel anvil bench. A heavier anvil will deflect less than a lighter anvil and offer more counter-force to each hammer blow. The more an anvil reflects the hammer blows back into the work, the more force that is imparted into the iron being forged. A 100-pound anvil might be good for a lightweight traveling shop used by a farrier, but even a farrier will have a heavier anvil in his home shop or shoeing shop. Smaller saddle-horse shoes don't need a lot of force to shape but draft shoes take a lot of force. Consequently draft horseshoers use heavier anvils. The same is true of ornamental ironwork. Light anvils may be easier to move to a around the shop but the lighter anvil offers less reflective counter-force and requires more effort by the smith to forge the iron. No flat top horns. Top surface of the horn MUST be rounded (no flat horns like those sold by Harbor Freight). Most antique anvils have some amount of damage on the edges. How much damage you are willing to accept is up to you. If a large amount of the edges of either side of the anvil are damaged, I strongly suggest you don't purchase that anvil. If an anvil is antique and has a perfectly smooth face and edges, it might have been arc-welded to fill in chips or other damage. To determine if arc-welder was used on the surface of the anvil, look for iron color distortions or a differing color makeup on the surface of the anvil. New anvils are the best value today! In early 2003 (January) I began recommending that new smiths abandon their pursuit of used anvils at auctions and simply buy new. I wrote: that a blacksmith could purchase a new anvil in perfect condition from the suppliers listed on this webpage for the same or less money than a used anvil. This statement has become more economically practical today. Prices of steel and tools have risen much higher since 2003. And unfortunately the prices of new anvils have also risen by more than double since then. Good used anvils have literally vanished off the market. What is left at all of the sales I have attended in the last 10 years, are broken down junk anvils that in some cases, look like a previous owner scrapped the junk anvils, and the current owners/sellers bought them back out of the scrap yard and are trying to sell the junked anvils to a bigger sucker. But what is really shocking is how high the prices of used anvils in poor condition have been bid up. As the numbers of anvils for sale diminished, prices increased astronomically to the moon. During the entire year of 2012, I found only one anvil for sale, and that anvil was a worn out piece of junk. The price bid for that junk anvil quickly bid up higher than a new anvil - reaching a price that could have bought a good new anvil that was 30% larger from Old World Anvils. A better deal. Prices of the Czech-made anvils are low enough that a smith can find a new anvil in his/her price range and it will be a heavier anvil than the worn-out used anvil and cost a lot less too. New anvils are now often substantially cheaper than used anvils. New anvils are simply the best value today. Style or shape of anvils. London pattern & American pattern anvils. These are the two most common styles of anvils used in the United States. The Names 'London' pattern and 'American' pattern, are names we have been using in the United States for many years. They may be named differently in other countries. 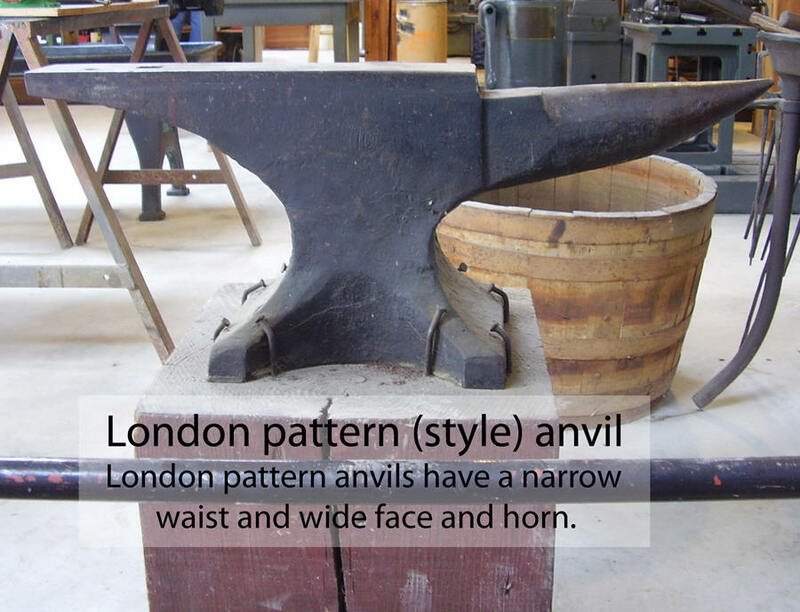 The difference between the London pattern and the American pattern anvils is the relative appearance or mass of the anvil. The London pattern anvils have a large face and horn, and a narrow waist. The American pattern anvils have a larger thicker waist. The London pattern anvils were very popular because the narrow waist reduces weight thus making the anvil easier to move or transport, and the wide face and horn provides an excellent large working surface for general work. Both the London and American anvil patterns have a single swelled horn. The swelled horns are very effective for making horseshoes because the swelled horn helps to shape the inside curve of the horseshoe with less distortion. European style two-horn anvils have two horns as the name suggests. A round (conical) horn that contrasts with the typical swelled horn of an American or London pattern anvil. The round horn presents a nearly perfect round cone in its cross section and is much more useful for drawing iron than the swelled horn. The opposite horn is square in its cross section and presents a tapered flat face surface that is useful for working inside narrow or hard to reach places of ironwork such as finials of ornamental ironwork. The Kohlswa B31 and Peddinghaus 18P2 are good examples of two-horn anvils. Many two-horn anvils coming from Europe will have a third horn mounted on the side of the face of the anvil called a clip-horn or auxiliary-horn. This auxiliary horn is basically an extension of the face of the anvil and serves to offer an extra surface to work with that has no base beneath it to foul the work or tools when forging some awkward ornamental work or when forging toe clips on draft shoes. The Kohlswa B34 and B36 are good examples of two-horn anvils with a third auxiliary horn. The auxiliary horn is placed on the anvil opposite the blacksmith. So be sure to note the placement and position of the anvil in your shop before ordering an anvil with an auxiliary horn. See the Kohlswa foundry website and follow the links to find the anvils they manufacture. German style two-horn anvils often have very distinctive features. The hardie hole of modern German style anvils is placed near the round horn of the anvil rather than near the tail of the anvil, and the hardie hole is positioned inside the area of the feet or base of the anvil. Placing the hardie hole inside this base area offers more support and mass beneath the hardie and the anvil is subjected to far less bouncing and shaking under the heaviest hammer blows. The German anvils place the horn right up next to the workface of the anvil, omitting the cutting block that is normally associated with the typical London or American pattern anvils. German smiths are taught to either cut only partially through the metal and finishing the cut off the edge of the anvil, or to cut over a iron plate placed temporarily on the anvil. The cutting block would have taken up valuable workspace on the anvil and moved the useful drawing area of the horn farther away from the support of the main body of the anvil. 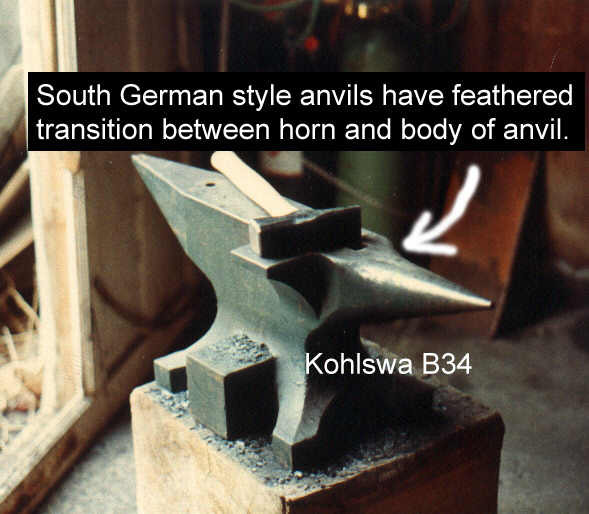 South German Style (Sűddeutsche Form) anvils have another very distinctive characteristic in addition to their other German features- a feathered transition from the horn to the face of the anvil. Unlike other patterns of anvils, the south German style anvil offers a single continuous work surface from tip to tail. There is no abrupt cutoff between the horn and the rest of the body of the anvil. Compare the anvils at left with the German style shown above in the previous paragraph, and this difference is very clearly visible. The feathered transition of the South German Style is considered by many smiths (including myself) to be a great advantage and utility in the use of the anvil. The feathered transition is applied to both the two-horn anvils and the single horn anvils. Thumbnail photos at left show a Kohlswa B-34 two-horn anvil, and a pair of Blacksmiths anvils distributed by Branco and sold under the name 'Workhorse' or 'Austrian' style by Old World Anvils. 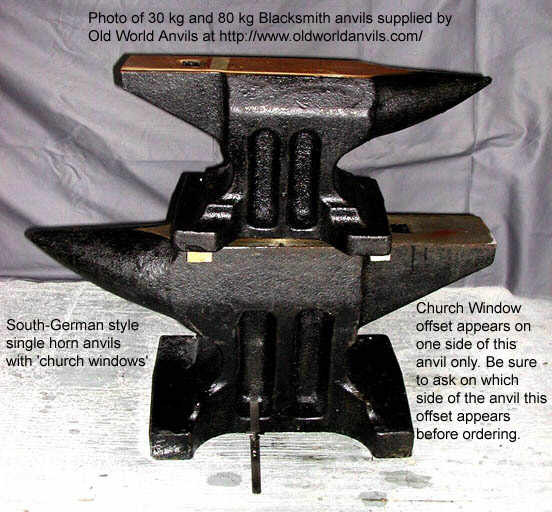 There are other styles of anvils imported by Old World Anvils company that also fit the south-German style. Two of the biggest are the 'Habermann' anvil and the 'Peddinghaus 200' anvil. Styrian style anvil. (Steirische Form) The Styrian anvil gets its name from the location or region in Austria where this anvil was favored. Styria is one of the states in Austria. This is the style of anvil used at Otto Schmirler's shop in Vienna Austria. 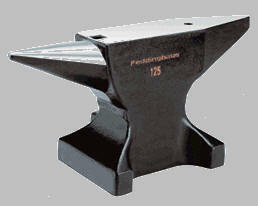 Old World Anvils sells this style of anvil under the name Austrian Style Workhorse. Italian style anvil. (Italienische Form) Italian style anvils are different from other two-horn anvils. The round hole is placed inside the large round horn, and the hardie hole is near the base of the square horn. Hardie holes in German style anvils. Hardie holes placed near round horns on some European anvils. The hardie hole on a German style anvil is placed near the round horn so that tools placed in the hardie hole will be positioned towards the left of the hammer when the smith is working on the face of the anvil. This is in contrast to the London pattern or American pattern both of which place the hardie near the heal of the anvil. Placing the hardie hole near the round horn instead of the tail of the anvil, moves the hardie tooling away from the hand-grip of the hammer and allows the smith to continue to work the iron on the face of the anvil without having to waste time removing the hardie between tasks. The German and Swedish and Czech anvils place the hardie hole near the round horn but the English anvils such as Vaughn/Brooks do not. Most blacksmiths set up the anvil with the horn pointing to the left while working. When a blacksmith swings the hammer, it falls in a way that the hammer head is moving to the middle or slightly to the left side of his body, while his hand grips the handle near the right. After working with a tool in the hardie hole the smith still does some work on the anvil face immediately after using the hardie. The smith moves the work to the center of the anvil to get the strongest blows while leaving the hardie in the anvil. It is too awkward and time consuming to remove the hardie during forge-work. The smith's fingers grip the hammer near the right side of the anvil and will repeatedly foul and strike the hardie causing injury to hammer handle and to his hand, while he works at the face of the anvil with a tool in the hardie hole of an anvil with a hardie hole to the right. Hardie holes are placed far outside the base of the area formed by the feet of the anvil on both the London and American pattern anvils. This means that the London and American pattern anvils are subject to more bouncing and shaking under hammer blows when striking metal over the hardie hole. Pritchel holes in these style anvils are located far out to the extreme ends of the tails of these anvils. When using the pritchel holes on the London and American style anvils the smith must be more careful to prevent the work from falling off the anvil while pritcheling the work. It is usually easier to pritchel over the hardie hole instead of balancing the work precariously over the far corner of the tail end of the anvil. The swelled horn is made for the purpose of turning horseshoes. The 19th and 20th century was a period in which mostly London and American pattern anvils were used in the United States. This was a period of horsepower and most smiths were as likely to shoe horses as they were to perform other shop work. The swell of the horn was designed to fit the inside shape of most horseshoes. London pattern anvils typically had very large swelled horns while the American pattern anvils had smaller horns. The anvil horn - swelled. The anvil horn - conical. Auxiliary horns and upsetting blocks. The auxiliary horn resembles a shelf extending from one side of the anvil near the round horn. The auxiliary horn always faces away from the blacksmith (mounted to the far side of the anvil). Keep in mind that the manufacturer assumes that the smith places the round horn of a double-horn anvil, to the left. The auxiliary horn is useful for a variety of purposes. One example is pulling clips on draft horse shoes. The clip on a draft horse shoe requires the smith to bob-punch the toe and then draw the thin dimple of extruded metal against the side of the anvil. The auxiliary horn allows the toe of the shoe to be held tightly against the side edge of the auxiliary horn without the tongs fouling the side of the anvil. To use a London pattern anvil for this same task requires the smith to step around the front of the horn to work at an awkward angle against the heel of the anvil. An upsetting block is often cast into a steel anvil at the feet or base of the anvil. The purpose of this block is to allow the smith to upset long bars at a lower height than that presented by the face of the anvil. This block is very useful and consequently this is why they are so commonly found on European anvils. The upsetting blocks are found on either the near side or far side of the anvils. This is a very important feature and many smiths have very strong preferences as to the placement of the upsetting block. An upsetting block on the near side of the anvil (Kohlswa B-36, Branco Peddinghaus 200) places the upsetting block in a very practical position for upsetting without need for walking around to the opposite side of the anvil or reaching over the main body of the anvil to jump iron on the opposite far side of the anvil. The only drawback to this placement is that the upsetting block forces the blacksmith to position the anvil on its work stand or bench approximately 1 inch farther back (away from the smith). Many smith do not consider this to be a problem. An upsetting block on the far side of the anvil (Kohlswa B-34 series, Peddinghaus brand two-horn anvils, Refflinghaus 1858-series, Branco Habermann) is still practical to use by walking around to the far side of the anvil or simply turning the anvil around so the round horn faces to the right and places the upsetting block to the near side. Many smiths do much of their upsetting on the face of the anvil or choose instead, to design their work to be drawn rather than upset. Positioning the upsetting block on the far side of the anvil allows the smith to mount the anvil approximately 1 inch closer to the nearest edge of the anvil bench. Anvil Brand http://www.anvilbrand.com/ Farrier tools and supplies. Cast steel anvils by JHM, GE, NC, Delta, Cliff Carroll, Swan, and Anvil Brand's own design. Hardies and other tools also available. Centaur Forge ltd. http://www.centaurforge.com Drop forged and cast steel anvils, Horseshoeing and blacksmith supply company in Burlington WI, U.S. TFS anvils, Emerson anvils, NC anvils, and Cliff Carroll anvils. Fontanini Anvil & Tool http://www.fontaninianvilandtool.com/ High quality two-horn design featuring a swelled horn. Great design for smith shops that handle everything from shoeing heavy horses to general blacksmithing to intricate ornamental ironwork. Custom design with great an awesome look. Kayne & Son - The Blacksmith's Depot. http://www.blacksmithsdepot.com/ New URL! Peddinghaus German drop-forged anvils. Kanca Turkish-made drop-forged anvils. These anvils are the last drop forged anvils made. 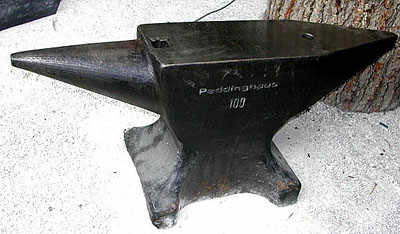 All Peddinghaus anvils are of the German style in which the horn cuts directly into the body of the anvil. Name brand Peddinghaus anvils. These are the real thing. These anvils supplied in a variety of weights and sizes. Two-horn anvils have upsetting block but not auxiliary horns. Kentucky Horseshoeing School http://www.kyhorseshoeing.com Kohlswa anvil distributor for North America. Cast steel anvils. Kohlswa anvils are fully machined and clean. Note that there is nothing on the KHS website about selling anvils. A prospective buyer would need to contact the school and ask about purchasing an anvil. The school stocks a few of the more popular sizes and styles that sell the most, but any anvil found on the Kohlswa website can be ordered from the Kentucky Horseshoeing School. (NOTE- if you want a specific anvil that he does not stock, then you may have wait anywhere from 3 months to a year to get it because the anvils are shipped from Sweden). Buyers must ask for current pricing information. Prices are competitive with the Czech anvils. I use Kohlswa anvils and my next anvil will also be a Kohlswa. Unlike some of the faces of the Czech made anvils, the faces on the Kohlswa two-horn B34 and B36 are level all the way across from the tip of the round horn to the tip of the square horn (a very practical design for ornamental ironworkers!). Nimba. http://www.nimbaanvils.com/ Made in the USA. Italian style two-horn anvils. Old World Anvils http://oldworldanvils.com/ Cast Steel Anvils. Anvils made in Czech Republic. The horns on these anvils are not machined smooth. Selling many types including the south-German style two-horn anvils including the Habermann style similar to Kohlswa B34, the Branco Peddinghaus 200 featured as "The Ultimate" that is similar to Kohlswa B36 with the addition of 15 degree offset. Single horn anvil styles including the Bavarian or Austrian style blacksmiths' anvil featured as "The Workhorse" with church windows like those seen in pictures of Otto Schmirler's shop in Vienna Austria. Branco anvils are very economical. A quick word on anvils for new smiths, the "Workhorse" blacksmith style anvils come in a wide variety of sizes and prices that make a new anvil affordable to beginning blacksmiths with a small budget. Again buy the largest heaviest anvil you can afford when starting out. If you can afford a 200 kg or heavier anvil then consider the Habermann anvil or the 200 model "Ultimate" anvil as well as the Workhorse anvils. I recommend the 200 model 'Ultimate' because the horn is made horizontal and level with the face of the anvil. Pieh Tool Company www.piehtoolco.com/ Blacksmithing and farrier tools and supplies. Selling high quality anvils for blacksmiths and farriers. JHM anvils, Peddinghaus (Handwerkzeuge-Durlach), Peddinghaus (Rigid-Belgium), TFS anvils, Cliff Carroll anvils, and NC anvils. Kohlswa Cast Steel Anvils. A steel foundry in Sweden that makes the Kohlswa anvils used by many ornamental iron shops. Fully machined and clean. http://www.kohlswagjuteri.se/ These are the anvils I buy for my own shop. These anvils continue to be made in the traditional shapes that professional blacksmiths demand- unlike many of the anvils made for anvil suppliers in the U.S. Thanks to one of my readers I have learned that Kentucky Horseshoeing School is a dealer for these anvils in the U.S. (see links for North American anvil distributors above) with delivery time roughly 3-4 months and sometimes up to a year as told to me by one of my readers that has recently bought a new Kohlswa from the school. Strassen Industriemuseum. http://hsfriedenshoehe.net/kse/page2.htm Original equipment and tooling of the Refflinghaus Anvil Smithy set up as an outdoor street museum display in Ennepetal, Germany. This website is a school project completed in 1998. Their new home page: http://www.hsfriedenshoehe.de/ . This link was updated 17 February 2005. Page updated on 02 November, 2017. This page created on October 1, 2002.